Dave Elger on Running, Racing and Training: Bill Rodgers 1975 Training Log: Don't Try It! Bill Rodgers 1975 Training Log: Don't Try It! 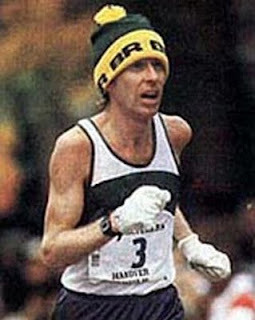 Bill Rodgers is one of the best distance runners the U.S. has ever produced- winning New York and Boston 4 times each! Bill Rodgers ran 2:09:55 at Boston in 1975. Check out his race calendar for the year- 23 competitions. Quite a contrast to some of America's top marathoners today. This is how it was the days before major shoe company sponsorship- Rodgers had to race often just to make ends meet.